For one of the film’s pieces of artwork on sale in the shop, we asked Phil Wolstenholme, the mind behind some of the most classic Warp album designs, to come up with a little piece of computer art reflective of his time represented in the film. We never expected him to come up with such an amazingly intricate and personal piece of art! the coalface of inventive computer art for nearly 20 years, and has inhabited a variety of strange but CGI-rich environments during that time. Often working in conjunction with Designers Republic, Phil produced some of the most enduring sleeve images of the electronic/techno phenomenon from the early-to-mid 90’s. 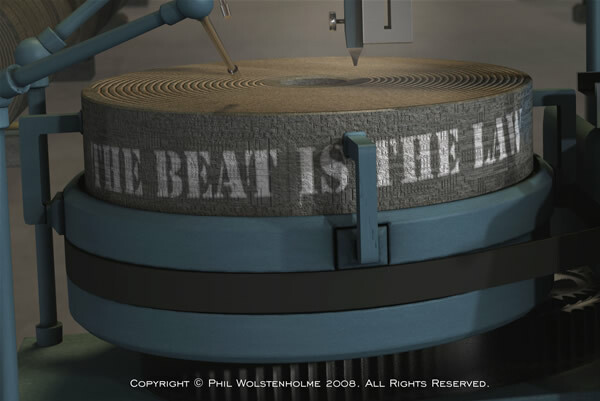 In his cover images for musical artists such as 808 State, The Orb, and Cabaret Voltaire, and for clients such as Warp Records, Designers Republic, Sony Japan and Strictly Rhythm, his unique style and pioneering use of 3D imagery helped define the look of a whole new musical genre. 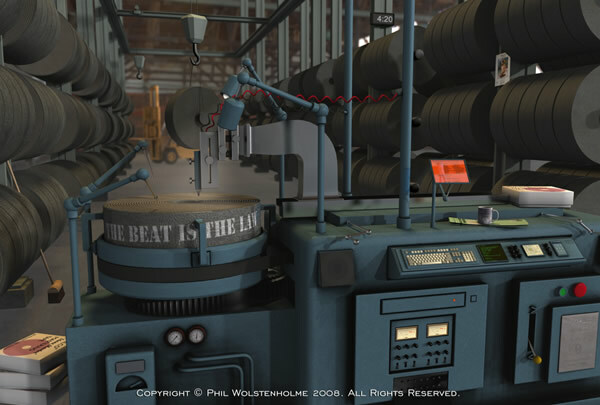 In 1993, together with CG artists David Slade and Jess Scott-Hunter, he produced a still talked-about (and still influential) video release that set Warp’s finest electronic musical artists against ambitious CGI, in a suite of plot-based animation sequences. On a miniscule production budget, ‘Motion’ exceeded all expectations, and launched at the ICA in London, was a huge success. Alongside this were projects such as a collaboration with the British composer Gavin Bryars, producing 3D animation for projection during live orchestral performances of ‘Sinking of the Titanic’, 1995. Since these heady days, Phil has continued to produce commercial CG images, is a panoramic landscape photographer, and has also worked extensively within the software industry, designing, developing and demonstrating new 3D software packages and literature. Phil recently exhibited a new body of work at a former monastery in Provence, France. He has also launched a publishing company, Heavy Everywhere®, producing digital fractal imagery for fabric, interior design and other product lines. The first fashion release is a range of luxury swimwear on a new label in January 2009. This entry was posted on Friday, November 14th, 2008 at 2:05 pm	and is filed under Film News. You can follow any responses to this entry through the RSS 2.0 feed. Both comments and pings are currently closed.